...the Starter Kit during Sale-A-Bration!! The Canadian kit is now only $208+PST (no S&H or GST). This is phenomenal news, as it's a savings of $52 off the regular price of $260, PLUS you get to choose any priced stamp set from the catalogue for FREE and then you ALSO get to choose a FREE Sale-A-Bration set (from me) as my extra special "thank you" for joining my group. Beginning tomorrow February 1, you can order your Starter Kit online HERE at that reduced price, and then please contact me to let me know which SAB set YOU would like in addition. 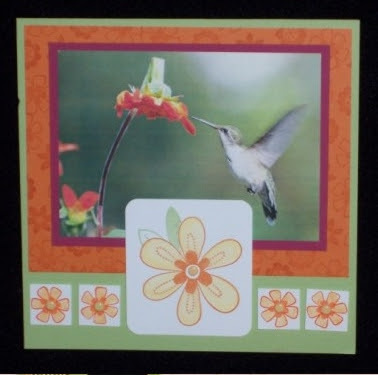 Today's featured SAB set is Friendship Blooms, and here are some cards, scrapbook page layouts and a coaster box... all from our recent Leadership conference. Don't forget, if you have your SAB order in to me by midnight on Thursday January 31, you'll receive FREE S&H - a savings of 10%! Order will be placed first thing on February 1, so don't delay and get those orders in to me on time to qualify for this deal. (Sorry, this offer is valid only in Canada and through me). And what's not to love when it comes to FREE STAMPS?!? That's right, Stampin' Up! 's biggest sale of the year is back from February 1 to March 17. Check out the new SAB mini catalogue on the left-hand side of my blog to check out the 6 different items you can choose from for FREE with every $70 order placed during that time frame. There are 5 exclusive stamp sets and 1 set of rub-ons and they are all fantastic; I've been having such a blast playing with them for this past month. 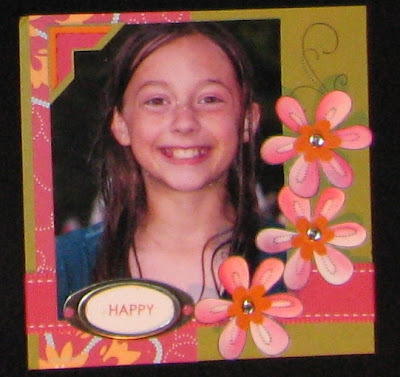 I also participated in a cardfront swap (you know me and my swaps!) so I'll be getting those samples here at the studio by Friday, ready to share with you! 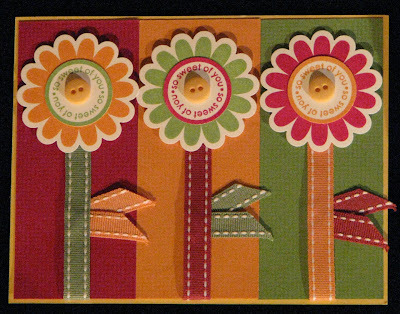 To brighten up a dreary morning, here are 4 FABULOUS swap cards I received at leadership using the "Fabulous Flowers" set. Let me tell you, that's one set that I've had my eyes on for a while and plan on picking up during Sale-A-Bration. You can never have enough flower sets, I tell ya! Are you coming this weekend for my New Catalogue Open House? I have all my new samples from Leadership on display, a really cute stamp set to give away as a door prize (hint: it's one of the new Level 1 Hostess sets! 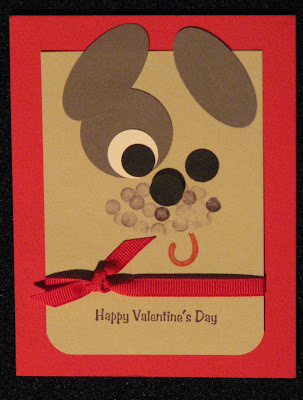 ), some fun 3-D projects to check out and THIS card as a free Make & Take project. 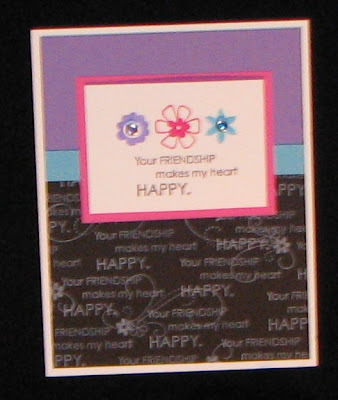 It uses the new "Sweet Celebrations" set, the Bali Breeze designer series paper, a Build-A-Brad plus some fun punches and ribbon. For more information on what hours my studio doors will be open, please visit my Classes & Events page. An RSVP is required... hope to see you there. Here are two more cards we are making tonight... I'll keep the last one a secret for those who are attending or are getting the kit "to go" :) You can see the other two in previous blog posts if you scroll down the page. Don't let the snow stop you! Come on by tonight, I'd love to see you. 7 PM. 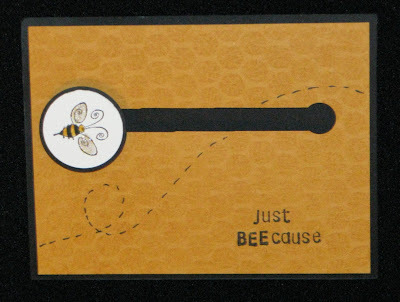 I'll be hosting a one hour Information Chat about Stampin' Up! 's business opportunity and the Starter Kit. With Sale-A-Bration coming soon, this is a great time to get started, plus you'll receive an extra TWO FREE STAMP SETS in addition to your fabulous Starter Kit. Want to know more? Please contact me to either RSVP or get a free Information Package mailed out to you. JAN 25 & 26 - NEW CATALOGUE OPEN HOUSE! Come and see the new amazing card samples and WOW projects I’ve brought back from our annual Leadership event. There will be a free make & take, new products to show you and some great doorprizes. I'll also be selling off/giving away my retired stamp sets and accessories! Pick up your new catalogue while you’re here... you don't want to miss this. Please RSVP with your date of choice. 7 PM. Want to see what we demonstrators do in our spare time? 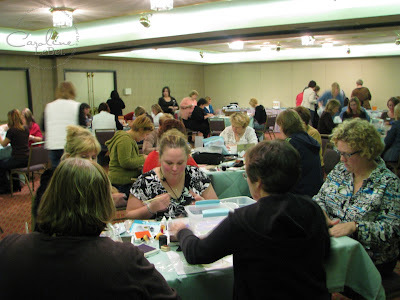 Come join us at our monthly team meeting, and have fun stamping and learning! 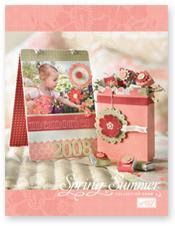 We'll be making projects using the new Sale-A-Bration sets. Don’t feel shy… bring a friend along if you like. Please RSVP; first-time guests are always welcome. Leadership 08 Highlights: The Classes! 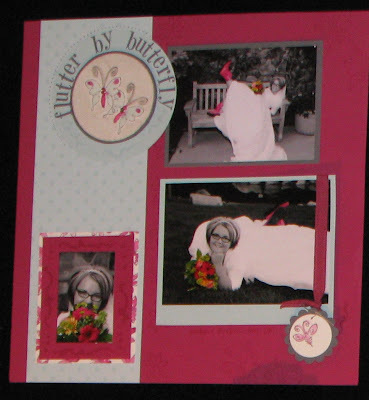 Before I get started on showing some more goodies from Leadership, let me show you another card we are making at Tuesday's Birthday card class. There's a good reason I'm showing you this, since it's something cool I learned while I was there. 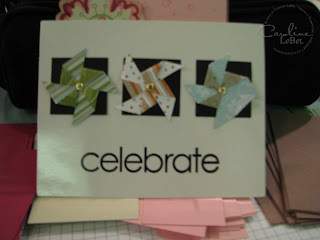 The beads are affixed using a staple... super easy but a pretty neat way to use them on a card! 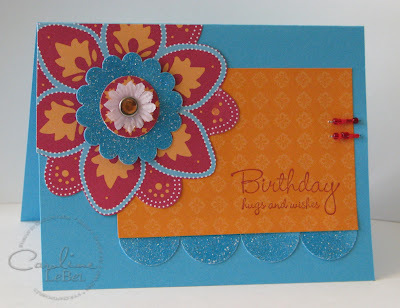 I absolutely love the "Bali Breezes" patterned paper and that's where the orange piece came from, as well as the large flower I cut out as a main accent. Some Iridescent Iced Tempting Turquoise punched paper, a Pretties flower and a Fire Rhinestone Brad round it all out. 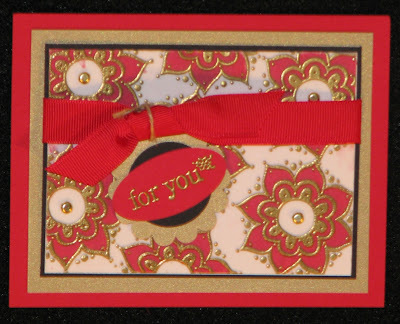 Carrie Cudney demo'd a version of this card on the Main Stage when she showed us some "Eastern Eclectic" ideas to go with that new Style Watch from the Spring/Summer 2008 Collection. Her card used a white Rub-On but we'll be stamping a birthday greeting in Purely Pomegranate instead. Don't worry -- I have a whole weeks worth of Rub-on projects I'll be showing you in February. I've been stamping up a storm and saving them for you, plus all the cool ones I took pictures of in Palm Springs. Here's a cool project she demo'd that uses a piece of wood that's been altered with some of the Designer Paper, and those larger black office clips that have been decorated as well. 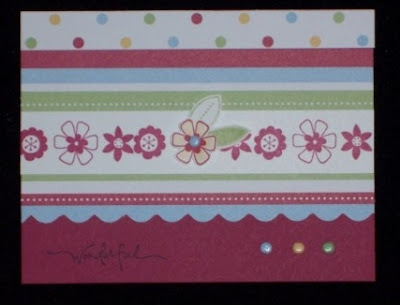 You could use this to hang cards from or use in some alternate home décor way as well -- the applications were endless! Now here's a card where she altered HAIR CLIPS and then added them to a card; wouldn't that be a cute gift for some little girl you know? I know my little niece Sarah is addicted to all things hair-related right now, so you had better bet I'll be making her some cute spring-themed ones for Easter. 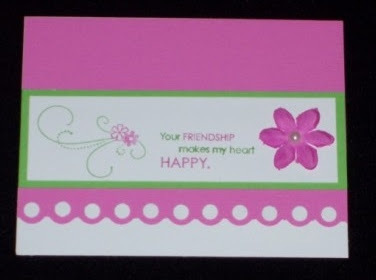 And this yet another accented clip incorporated into a card. See what I mean about how fun and easy these could be to make??? Use your punches, brads, flowers and your imagination to come up with your own applications! I'll leave you with this final project, and yet another way to use one of those office clips, but this time using our new Felt Flowers. Ain't it purdyyyy? Please leave me a comment if you'd like to see more... as I have loads of Leadership pictures I'd love to share. 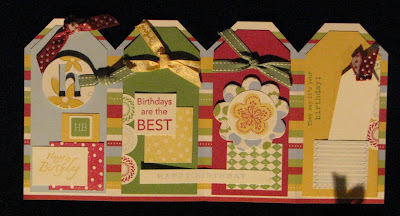 On Tuesday night, I will be holding a NEW monthly class: one where we’ll make 5 different birthday cards each time. I don't know about you, but it seems I never have enough birthday cards on hand, so here's a great way to solve that problem. 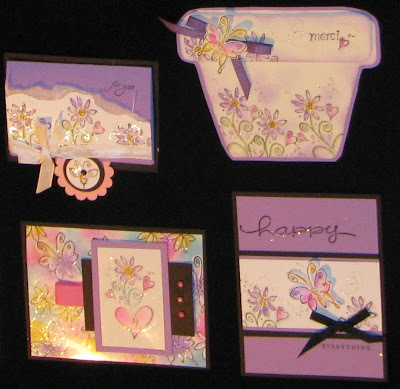 At each class we'll make 1 masculine, 1 feminine, 2 children and one generic birthday card, all with matching envelopes and a cheat sheet to take home. 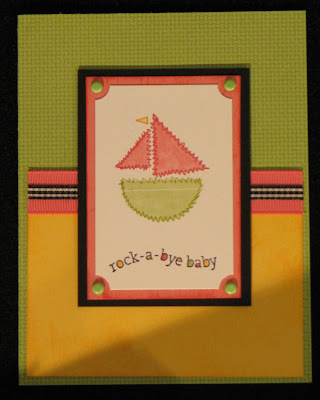 Here's a sample of what we'll be making Tuesday -- this fabulous card that was swapped with me by Kelly Crandall at the Splitcoaststampers dinner at our Leadership conference in Palm Springs. Isn't she talented? 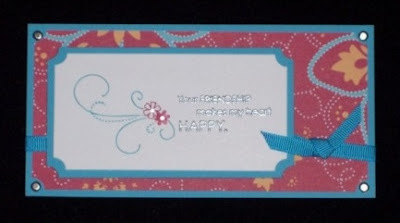 I knew we'd be making this card the moment I saw it ('cuz it's so stinking cute), plus it uses the new "Bali Breezes" paper and Level 2 Hostess set "Cause for Celebration" which I just happen to have ready for us to play with. Yippee! The cost is $24.95 per person or FREE with a $60 order placed Tuesday night. 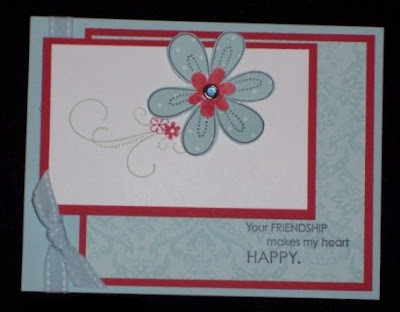 Stampers Club members receive $5 off class fee, and my "Canadians, INK!" demonstrators pay $14.95. Please RSVP to hold your spot or if you live outside of Toronto or just can't make it, let me know if you'd prefer to have the card kit "to go" option. Unfortunately I was having Blogger upload problems yesterday so I'll be back to sharing more of my Leadership highlights with you tomorrow. If you have a special request of what you'd like to see, leave me a comment below and I'll try to accomodate you! Leadership 08 Highlights: The Display Boards! Stampin' Up! 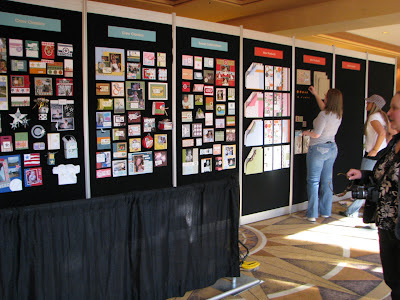 events *always* have amazing displays, so we kind of snuck in to the Convention Centre in Palm Springs a day before the official start, so we could have our own "sneak peek" at the samples, and not have to jostle for space to take pictures. Aren't we bad? Here are just a FEW of my faves...and ETA thanks to Diana Gibbs for identifying the first sailboat card as being hers, yippee! Tomorrow I'll share some of the cool projects that were DEMO'd to us on the Main Stage, many of which were absolutely fabulous and had us scrambling to take as many notes as possible. 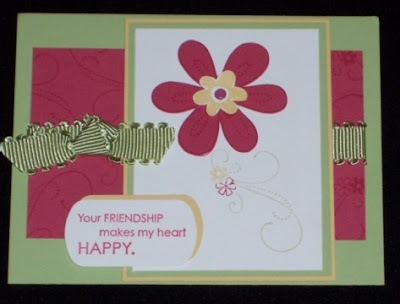 I'll also share a sneak peek of a card we'll be making on next Tuesday's "Birthday Cards" camp, that uses an innovative way we learned to utilize staples on your card. I know you'll love it! Leadership 08 Highlights: The swapping! Now that I'm home and about 1/2 way caught up on everything (only 300+ emails to go! 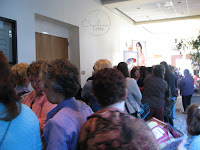 ), I thought I'd spend the next few days sharing some of my key highlights and memories of my trip to Palm Springs for Stampin' Up! 's Leadership Conference. Today... we concentrate on the SWAPS! 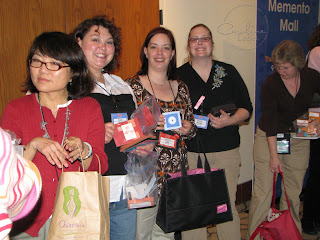 Swapping has always been a key part of my SU event for me, since I just LOVE to bring back fabulous new ideas to my stamping friends back home, and this time was no exception. Yes, I was still assembling swaps enroute but that just meant I could have MORE lovelies to swap out! 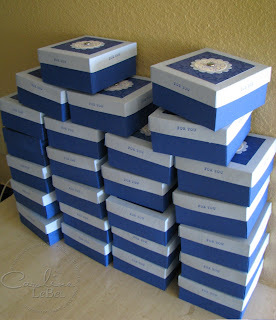 On the Wednesday night, I participated in a giant Shoebox swap at the Hilton Hotel with 47 other participants. Basically this is where you brought all the supplies to let 24 people make your card, and you had 24 cardfronts already ready to swap. That way, 1/2 the room MAKES your card that night, and the other 24 get the card pre-done, while you go and make 24 cards and get 24 made. Sound complicated? 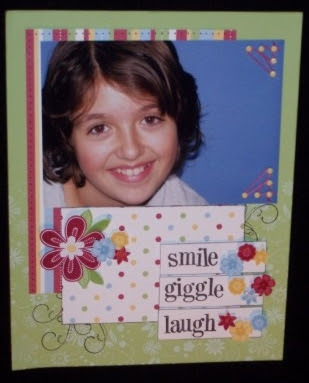 Kind of, but the reality works great and by the end of the night you get 48 cardfronts (having made 24 yourself). Still with me? LOL! Sherrie Robinson organized it and she did a FABulous job -- I had a real blast. Then of course there were the organized swaps.. the ones you sign up for in advance. 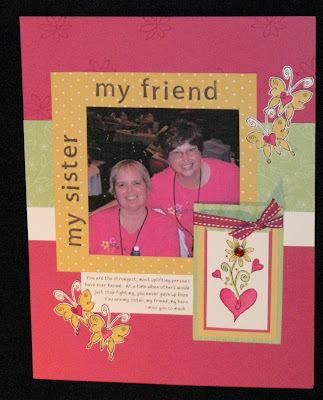 I participated in several, ranging from cardfronts, 3-D items, WOW cards and even an "over-the-top" WOW swap, hosted by my good friend Nancy Gauthier. 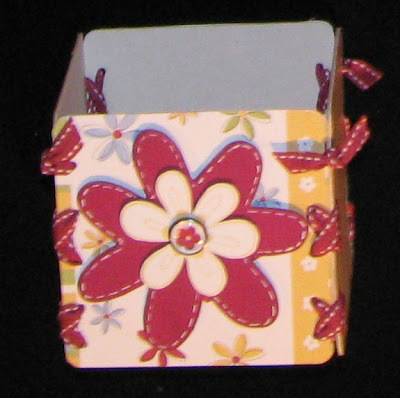 For instance, here are the 24 little 3x3 card boxes I made for one such swap, and here I am in line swapping them! And then there's just the madness of free-style swapping... that which happens whenever you get 3 or more stampers congregating together (and it even occurs in airports, let me tell you). This is WAY fun, and kind of frenzied, since you always find just one more person you NEED to swap with, and you inevitably run-out JUST when there's some fabulous card you need to have. That's when your handy camera comes into play, and you can take pictures of people with their swaps! 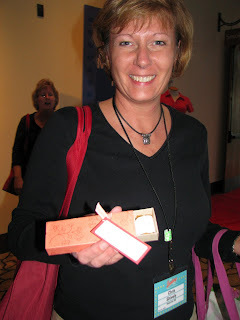 For instance, here is Chris Shively with one of her swaps, a really cute nugget box that I just had to snap a picture of. And I love nugget boxes SO much, I'm going to include one in my "Love Potion #9" Valentine's Day stamp camp in February, too. 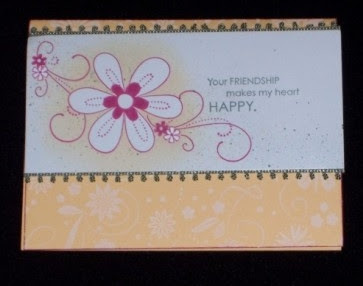 Maybe we could make it out of the new "Berry Bliss" Designer paper, with a tag made from the "Happy Heart Day" set that's on sale right now? Something to think about! Mmmmm.... chocolate. 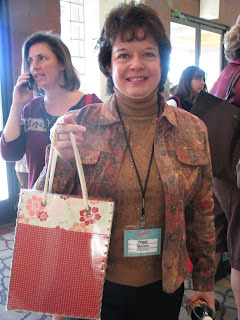 And here's Peggy Murwin -- I *loved* her swap bag made outy of laminated designer paper and then hole punched down the side, with hemp holding it together. Tomorrow's post will concentrate on some of the great cards & projects that I saw on the display boards, so let me know you stopped by and I hope to see you here again soon! Good morning, my dear stampers, from sunny California! I've been happily ensconsed since Tuesday night in this little jewel of a town, nestled under a mountain range. The weather has been lovely, especially when compared to your typical January weather in Toronto, and the sunshine a welcome surprise. I can't wait to share all my pictures when I get back (although my roomate Corinna posted a picture of the view from our balcony on her blog). Up until now we've been busy swapping, stamping, swapping, stamping with a little shopping & napping thrown in to the mix. Hey, why not? Oh, and of course visiting all my stamping buds from across Canada and the US that I only get to see at these larger scale events. But the Leadership conference officially begin in about 40 minutes, and I'm greatly looking forward to all the fabulous classes & just plain STUFF I'm going to learn...and bring home to share with you. DON'T FORGET: You still have this weekend to take advantage of my FREE S&H special for all orders over $75... just send me an email and we'll get you sorted (offer valid in Canada only). Until I check in again, happy stamping! ha.... you guys thought you were done with me today, didn't you? Just a quick note to say I've landed safe & sound in Denver for my 3 hour layover before taking off for PSP later this afternoon. What's an internet junkuie to do but find herself a booth to get plugged in? Behave yourselves while I'm gone -- I promise to log in during the Leadership conference to share anything earth shattering if it comes up! And yes Dina, lots and lots and lots of swapping, I promise. I'll take pictures to prove it! Bye Bye for now -- off to Palm Springs, CA! I'm leaving in a few minutes for the airport, where I'll spend a glorious day hopping through customs, line-ups, more flights, etc until hopefully I end up in Palm Springs, CA around 7pm ET! I'll be gone all week for our leadership conference, and I look forward to posting (internet-café) while I'm there. In the meantine, be good!!! Happy New Year to you all, dear readers! 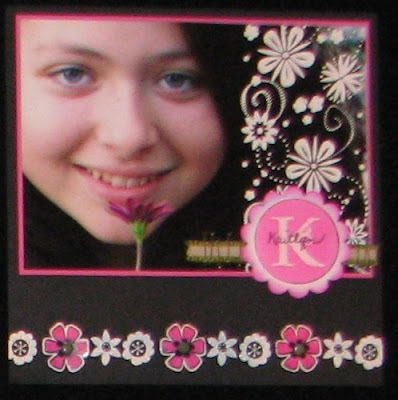 Now, I ask you.. what lovelier way is there to kick off the new year than a fabulous new Stampin' Up! catalogue? Chock-full of fantastic new stamp sets, accessories and LOADS of gorgeous fresh samples, you're sure to find lots of inspiration from this book. Canada Post is slowly resuming for business so hopefully those of you who have ordered your books will be getting them soon, or just CLICK HERE to see it online. And of COURSE you all know that I wouldn't NOT have a few good specials for you to get all excited over, yes??? No??? YES!!!! 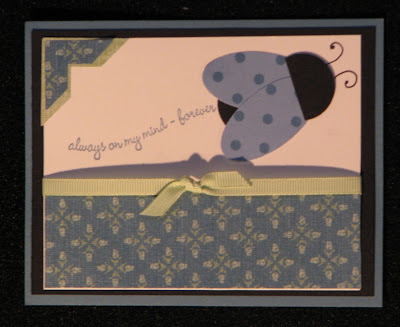 To learn all about my FOUR different Stampin' Up! specials for the month of January, please be sure to sign up for my free e-newsletter (see link on the left). There will be customer, hostess, new demonstrator specials plus more on the new Valentine's Day bundle.